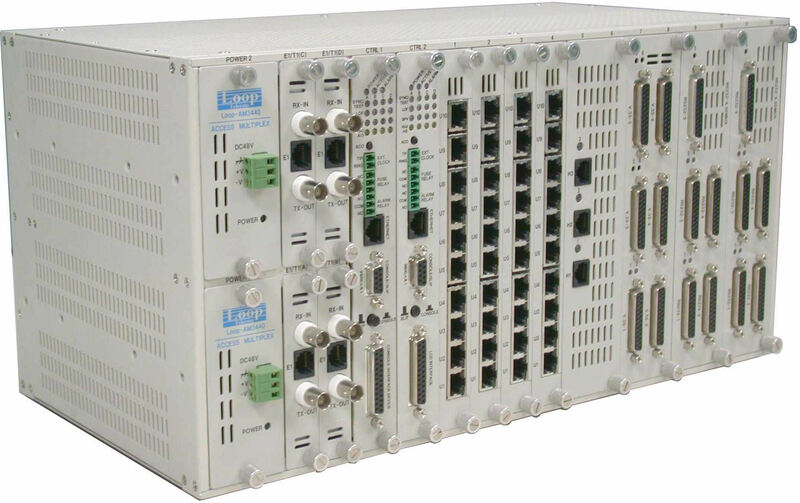 This unit is a full cross-connect; one or more of the WAN ports can be used as a Drop & Insert function with fractional E1/T1 lines, which can be muxed into a full E1/T1 line. The O9550 provides two optical line signals at STM-1 (OC-3) or STM-4 (OC-12) with protection schemes including MSP (1+1) and SNCP protection in both ring and linear network topologies. Redundancy is available in dual CPU controllers and power supply options, making the O9550 an excellent fit for critical applications. The chassis does not need or contain fan cooling, though an external fan tray is available. For detailed information on the many interface cards available for this product, please click here to download the 19 page printable data sheet. Available Interface Cards. Card Details are available on the detailed pritable data sheet. The O9550 can be configured as either a Terminal Multiplexer (TM), a Linear Add/Drop Multiplexer (ADM), or as a cross-connect (DACS) within the same enclosure. The Loop-O9550 can easily provide an economical, well-protected transmission path and integrated access in various applications as an Integrated Multi-Service Access PLatform with full cross-connect capabilities. Pricing: The price point of this versatile product is surprisingly low. Please call our toll free number: 800-432-2638 for pricing and additional ordering information.